This work came out of The Place’s unique international research and development project Choreoroam. A solo for Darren and his drumsticks, this is an exploration of practice and the quest for perfection. Just as a drummer must lock and focus his co-ordination, measuring out a rhythm to entice people to dance, a simple rhythm can inspire armies to move. When the sticks take control that’s when the trouble starts. 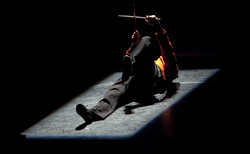 Sticks and bones has toured both nationally and internationally thanks to Dance 3 NDN tour , DanceEast and Aerowaves.